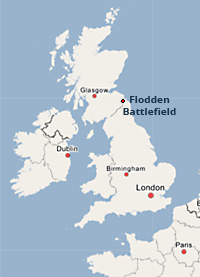 Battle of Flodden Field (September 9, 1513)—a young Scottish king who walked the world stage is killed. 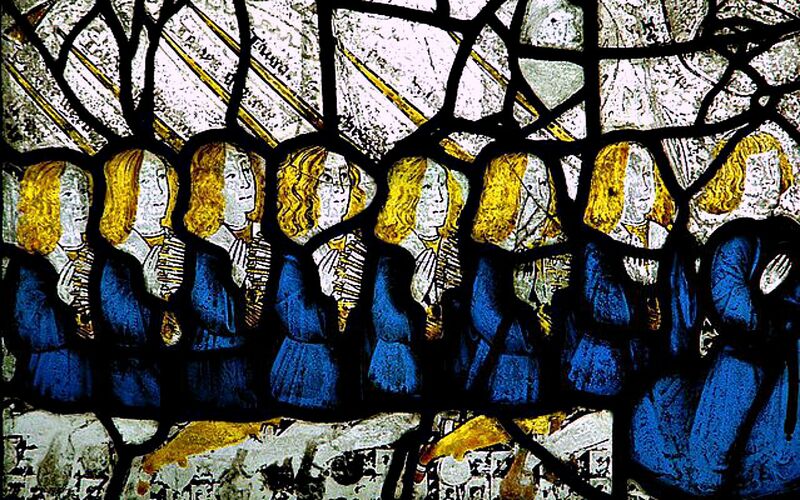 The Flodden Window (detail) in the Parish Church of St. Leonard in Middleton near Manchester in England. Completed in 1524 by Sir Richard Assheton of an illustrious military and religious family, St. Leonard was built on previous Norman and Saxon buildings and intended to celebrate Sir Richard’s knighthood by King Henry VIII for his part in the Battle of Flodden Field in 1513. The stained-glass window memorializes archers from Middleton who joined the battle on the side of the English. The battle itself took place about 200 miles to the north from Middleton and about 4 miles from the Scottish border inside of England near Branxton. 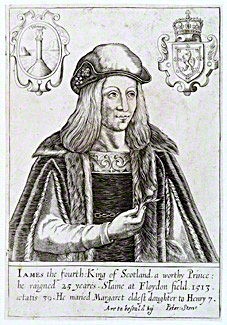 James IV of Scotland (1473-1513). Published by Peter Stent, line engraving, c.1643-1667. 6 7/8 in. x 4 3/4 in. (17.6 mm x 12.2 cm) paper size. Given to the National Portrait Gallery, London, by Sir Herbert Henry Raphael, 1st Bt, 1916. Portrait of James IV, after 1578, artist unknown, 41.2 x 33 cm, National Galleries Scotland. 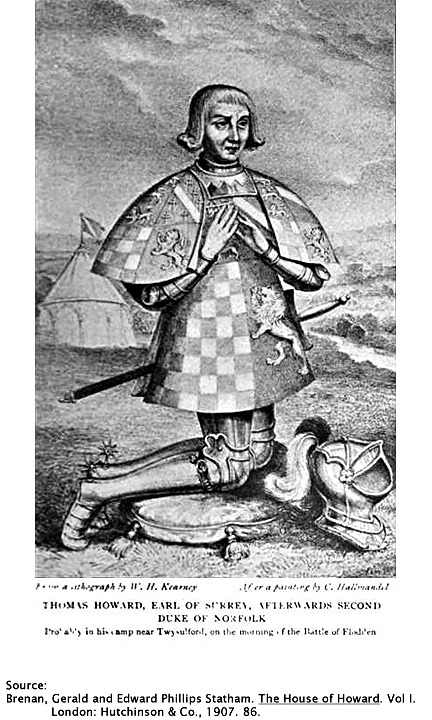 When James III was killed at The Battle of Sauchieburn fought on 11 June 1488, his fifteen-year-old son James IV succeeded him. He had been the rebels’ assumed figurehead, and for his indirect role in his father’s death James decided to wear a heavy iron belt for the rest of his life. 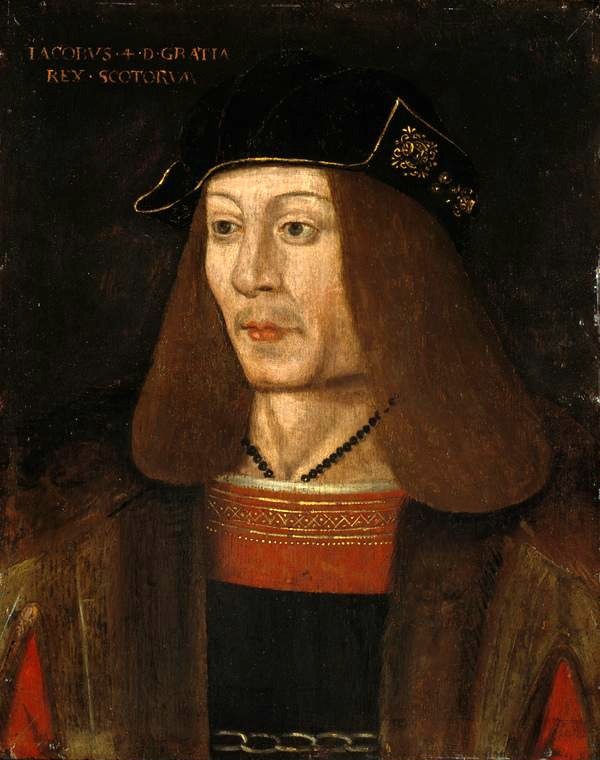 A highly intelligent man, James IV proved an effective ruler. He spoke many languages and took an interest in literature, science and law. Determined to establish strong central leadership he suppressed The Lord of the Isles and created a powerful navy. In 1503 he married the English king’s daughter, Margaret Tudor, in an attempt to create peace between the two countries. Yet when England invaded France, James felt obliged to assist his old ally. He confronted the English army in 1513 but was killed in the disastrous battle of Flodden. 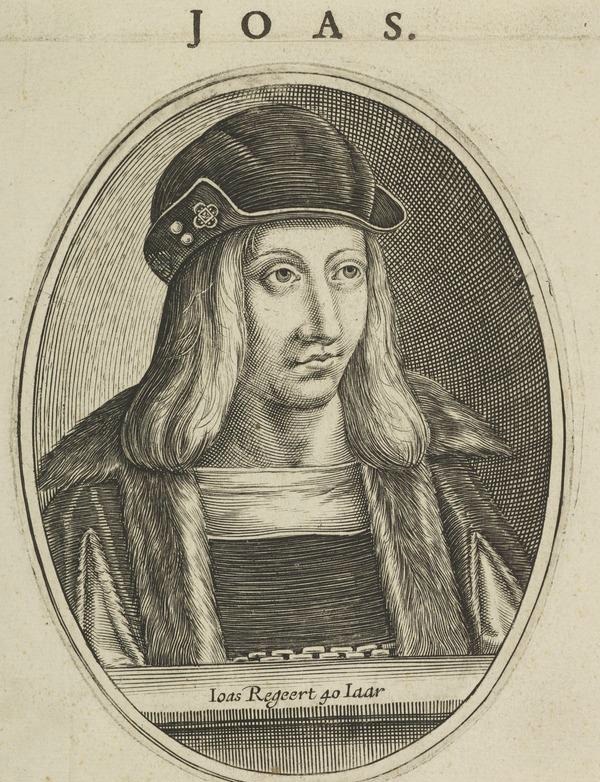 James IV, 1473 – 1513. King of Scots, 17th century, artist unknown, work on paper, 13.33 x 10.16 cm, Scottish National Portrait Gallery (Print Room). 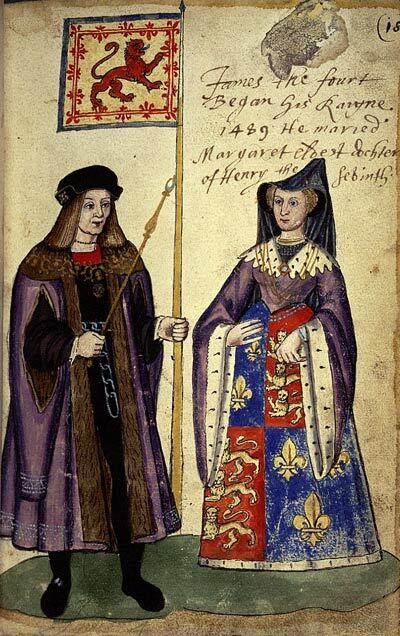 James IV married Margaret Tudor (1489-1541), the sister of future English King Henry VIII (1491-1547). 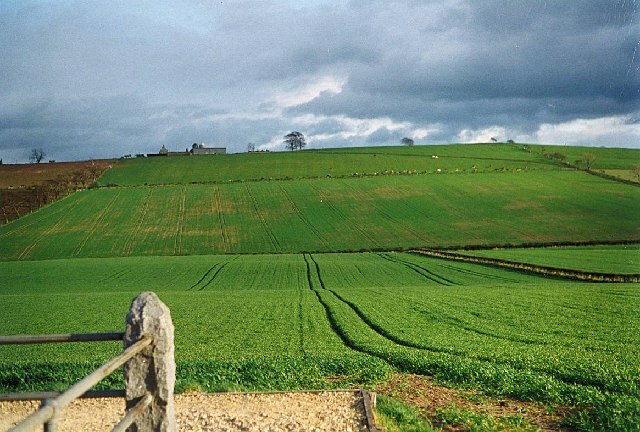 The Battle of Flodden Field was fought in the county of Northumberland in northern England on September 9, 1513, between the invading Scots army under King James IV and the English army commanded by the Earl of Surrey. Thomas Howard, 2nd Duke of Norfolk, Earl of Surrey (1443-1524). The battlefield today. The battle started with an artillery duel. The Scots brought heavy guns and had difficulty aiming at the English army at close range below them. Lighter English guns were able to target and pick off the Scots’ guns. In response, the Scottish left wing advanced downhill and wreaked havoc on the English right wing. The rest of the Scottish army then advanced. But the marshy valley floor bogged down the army including Scottish pikemen who became easy targets for English infantry. A third of the Scottish army was destroyed. One immediate consequence of The Battle of Flodden Field was to put James V on the Scottish throne. Born in April 1512 he wasn’t even two years old. The Scots were made to wait a generation for kingly leadership in very trying times. Thirty years later, in 1542, James V would die prematurely and was succeeded on the throne by his only legitimate daughter, Mary, Queen of Scots, who was only six days old. James V, 1512 – 1542, artist unknown, c. 1579, 41.30 x 33.00 cm, National Galleries Scotland. James V (reigned 1513 – 1542), father of Mary, Queen of Scots, became king at one-year old when his father, James IV, was killed at Flodden, fighting the English. 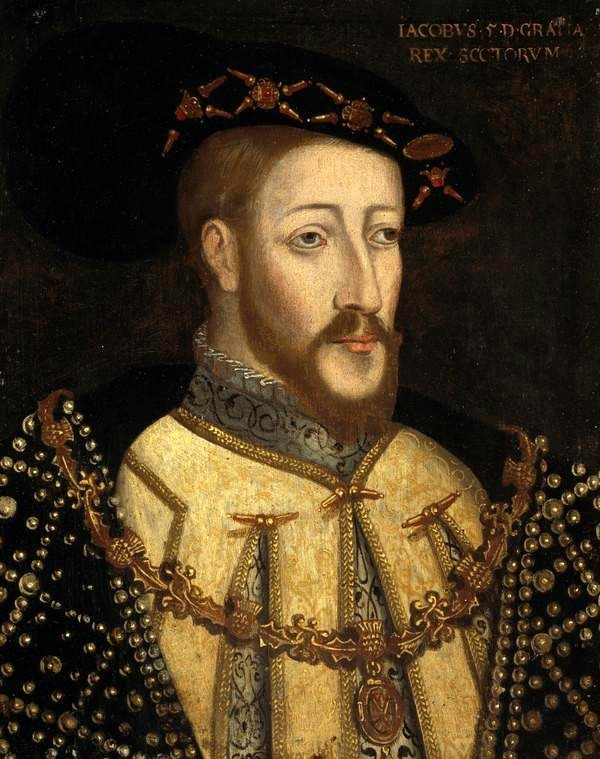 Ignoring the advice of his uncle, English King Henry VIII, to become a Protestant, James V strengthened Scotland’s alliance with its traditional ally, France, by marrying French King Francis I ‘s daughter, Madeleine of Valois (1520 –1537). When she died, he married Mary of Guise (1515-1560), another high-born French woman. James V died at Falkland Palace, soon after his army’s defeat by the English at Solway Moss, on November 24, 1542. His six-day-old daughter Mary succeeded to his throne. 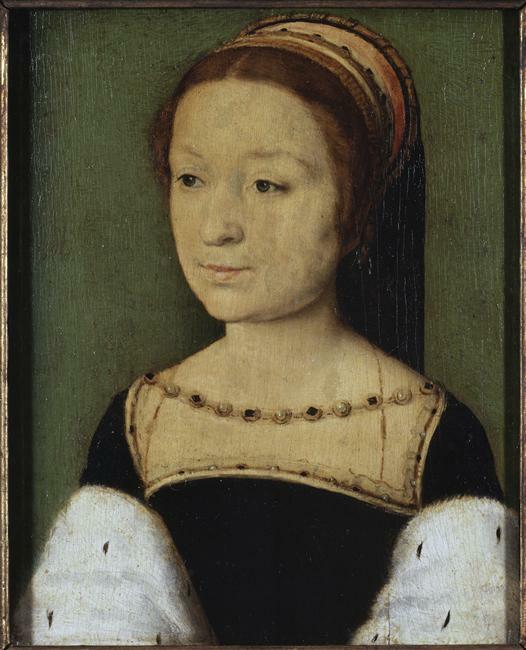 Madeleine of Valois (1520 –1537), Corneille de Lyon (1500/1510–1575), Musée des beaux-arts de Blois. First wife of James V of Scotland. They married on New Year’s Day 1537 at Notre Dame Cathedral in Paris. Of delicate health from birth, Madeleine died in July 1537. Portrait of Mary of Guise (1515 – 1560), Corneille de Lyon, c. 1579, 41.3 x 33 cm, Scottish National Portrait Gallery. Queen of James V of Scotland and mother of Mary, Queen of Scots. 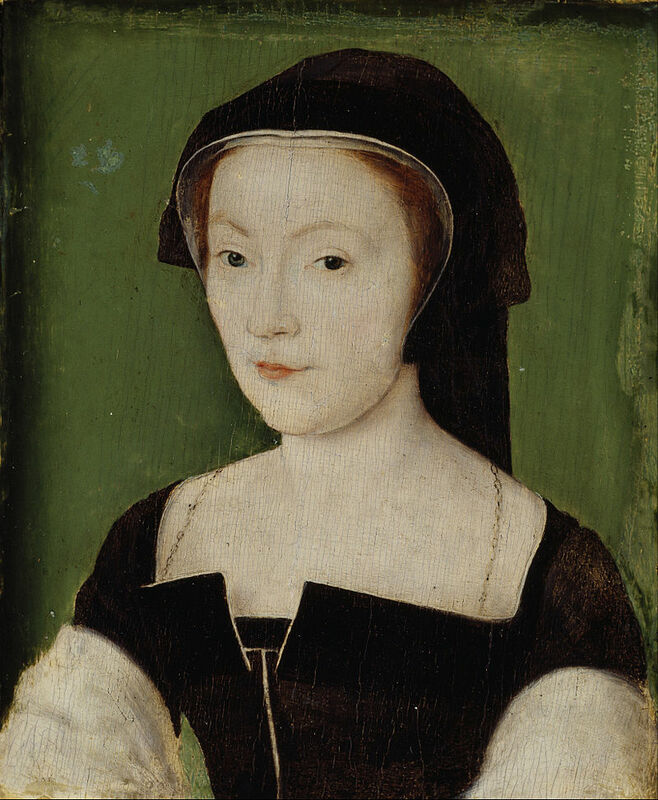 The daughter of a French duke, Mary of Guise had just been widowed when she was married to James V to strengthen the alliance between France and Scotland. Their two sons died in infancy and James died a few days after their daughter, Mary, was born in 1542. Mary of Guise chose to stay in Scotland, ruling as Regent to protect her daughter’s interests. Although courageous and determined, her efforts to keep the country in the French Roman Catholic sphere were unsuccessful and she failed to stem the rising tide of Protestantism. Mary, Queen of Scots, 1542 – 1587, artist unknown (after Francois Clouet, c. 1510 – 1572), 32.90 x 27.40 cm, National Galleries Scotland. Probably a 19th century replica after an image of 1561. 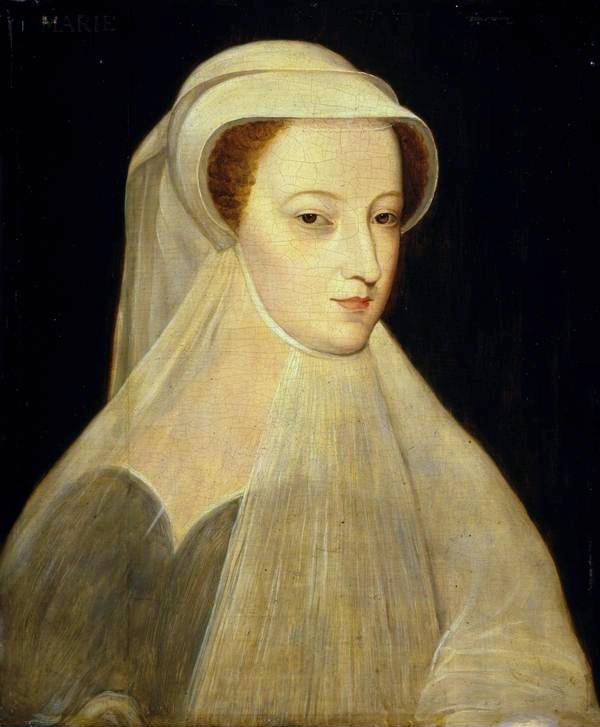 Within eighteen months Mary, Queen of Scots, lost three members of her closest family – her father-in-law, Henry II of France, her mother, Mary of Guise, and finally, on 5 December 1560, her husband, Francois II of France. She is shown here in mourning, wearing a white hood and veil. According to the Venetian Ambassador to the French court, Mary was inconsolable and her “tears and lamentations inspired a great pity” in everyone. Eight months later, having lost her position as Queen of France, Mary landed at Leith to take up her duties as Queen of Scotland. In a subsequent era Scottish poet Jane (or Jean) Elliot (1727-1805) wrote to an ancient Scottish tune a poetic lamentation for Flodden’s martial calamity. Published in 1776, it is called The Flowers of The Forest and is Elliot’s only surviving work. 1 Trevor Royle, Precipitous City: The Story of Literary Edinburgh, Mainstream Publishing, Edinburgh, 1980. pp. 16-17. 2 Stanford E. Lehmberg, “The Life of Thomas Howard, Earl of Surrey and Second Duke of Norfolk, 1443-1524 by Melvin J. Tucker,” The American Historical Review, Vol. 71, No. 1 (Oct., 1965), p. 158. 3 “The Flodden Death-Roll,” The Scottish Antiquary, or, Northern Notes and Queries, Vol. 13, No. 51 (Jan., 1899), Edinburgh University Press, p. 102. This entry was posted in Art, British art, World History and tagged Anne Boleyn, Battle of Flodden Field, King Henry VIII of England, King James IV of Scotland, King James V of Scotland, Lieutenant-General Thomas Howard, Madeleine of Valois, Margaret Tudor, Mary of Guise, Mary Queen of Scots on September 12, 2014 by jwalsh2013.